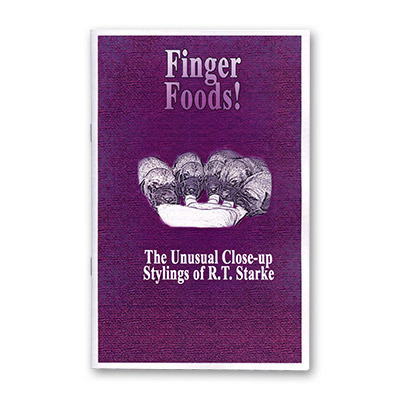 Today, when you order "Finger Foods by Starke - Book", you'll instantly be emailed a Penguin Magic gift certificate. You can spend it on anything you like at Penguin, just like cash. Just complete your order as normal, and within seconds you'll get an email with your gift certificate. The Whole Miracle: A card is selected, signed and sandwiched between two jokers. All three cards have holes punched through them and a ribbon is fairly threaded through the holes. All three cards are cleanly and clearly shown to be threaded on the ribbon, The cards are clipped together and seen to dangle from the ribbon. A Flick of the wrist and the signed, selected center card penetrates the ribbon without damage! The card can be given out as a souvenir! Nailed And Screwed: Here's an unusual effect- A small block of wood is displayed. There is a small hole drilled in the center. The performer takes a hammer, and short nail, which may be examined, and nails the nail into the block of wood. The performer then has everyone concentrate on the head of the nail. He wipes it with his thumb and the nail head suddenly changes in to a SCREW HEAD.... The performer then uses a small phillips head screwdriver to remove the (Nail transformed into a ) screw from the wood! Great lead in for other effects. UPC Miracle: Winner of a Linking Ring Award! A deck of cards, each with a bar code on the back, is used to cause a blank deck to: first print a freely selected card, unknown to both performer and spectator; then to cause the entire blank deck to become printed in the exact same order as the Bar Coded Deck; lastly a "glitch" in the system causes one of the cards to get printed in a crazy fashion combining cards from the entire deck into one. A complete card "act" that can play several minutes. No difficult sleights, but it WILL take some setup and practice. Stapled Card Mystery: Similar to an old marketed effect, but using not gimmicks and no where near as expensive. Performer has spectator select a card which is shuffled into the deck. The Joker is shown and slide sideways into the deck so it forms an X shape. A Stapler is set atop the deck, and then slammed down. Performer grabs sideways Joker and lifts top half a deck. A tilt reveals that a card is now STAPLED to the joker. The card is of course the selected card. The joker and selected card are taken apart by tearing the joker off, all is now clean and can be handed out! 1..2...3...ZAP! A Selected card penetrates the card box, and ends up threaded on the middle of a ribbon held tight by a spectator. Also includes a bizarre version with Tarot Cards! Items are all simply explained with illustrations, easy to make gimmicks, very basic sleights and subtleties! Focus on developing your presentation!